Source: BashTheBug – Help us fight antibiotic resistance! We need you to help us fight antibiotic resistance and tuberculosis! The discovery of antibiotics in the middle of the 20th century helped reduce the number of deaths from infectious diseases globally. Unfortunately, the use of antibiotics has led to bacteria developing resistance. To help tackle this rise in bacterial resistance to antibiotics, it is vital that Doctors know which antibiotics can and cannot be used to treat a patient with a bacterial infection such as Tuberculosis (TB). This is because using the right antibiotic to quickly kill disease-causing bacteria limits their opportunity to develop antibiotic-resistance. …The CRyPTIC project will collect over 100,000 TB infection samples from around the world. The project will run for five years starting in early 2017. The M.tuberculosis bacteria in each sample will have its genome sequenced and also its sensitivity to a range of antibiotics determined using a small 96 well plate. Each circular well has a different dose of one of 14 antibiotics. Every sample collected will be split and a small amount put into each well. 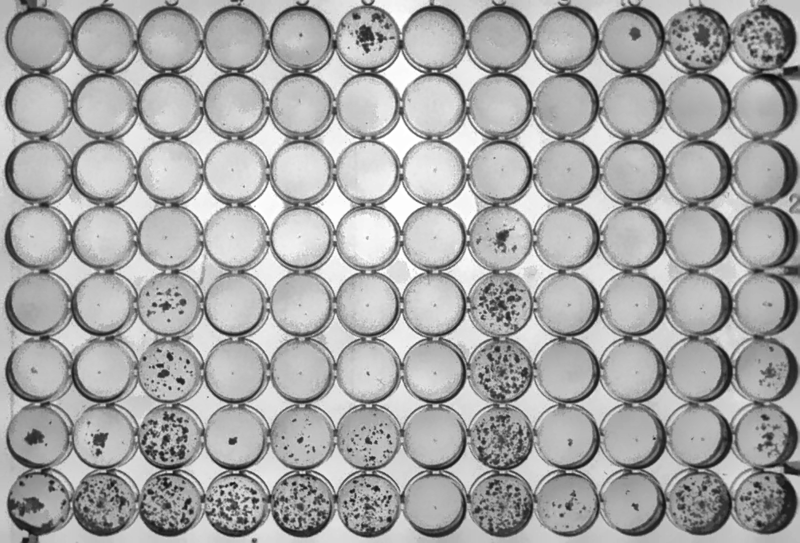 After two or three weeks each well in the plate is examined to see if bacteria are growing or not and a photograph is taken, like the one below. By comparing these results to the genetic sequence of that infection, we can work out which changes in the genome cause resistance (and equally importantly, which do not). All this information will help us understand and better predict in the future which M.tuberculosis bacteria will be resistant to which antibiotics. Although each plate will be examined by a scientist, they, like all of us, might miss something. It is vital for the success of the project that we accurately determine which antibiotics are effective for each and every of the 100,000 TB samples. We hope that by combining the expert opinion with the consensus developed by you, the volunteers, we will get a much more accurate assessment of each plate. Take a look at the project and tutorial for more information about how you can help. We’re also trying to use computers to process the images produced in this study, but they can be fooled by shadows, air bubbles and other things in the images. If you go to the Classify page you can learn how you can help and participate. It seems like it is sort of akin to Galaxy Zoo where they are asking people here to help classify some of the growth patterns they see. Definitely looks interesting. Definitely going to try it out.